All new protocols must use the electronic submission process in the eIRB module of eResearch. Investigators benefit from the elimination of all paper documents, the automatic routing of protocols to ancillary committees, the ability to follow the status of each submission as it moves through the approval process and the storage and tracking of all documents. The IRB does not accept paper applications or materials that are emailed outside of the eIRB system. All applications and supplemental materials to accompany new protocols, amendments, continuing reviews and reportable events must be submitted via the eIRB electronic IRB management system. See the page on Requirements for Approval for information on the criteria the IRB uses to determine if a study is approvable. And see the page on Naming Documents for guidance on choosing names for study documents. The investigator must determine which review pathway they believe their research should follow. Human subjects research can either meet the criteria for Exemption, it can be eligible for review using Expedited procedures, or it can require review by the full board. Investigators are not permitted to make this determination themselves. The categories are enumerated in 45 CFR 46.104(d)(1-8). For more information go to Exempt Research. Like all submissions, requests for a determination of exemption must be submitted using the eIRB system. Submissions qualifying for review using expedited procedures are reviewed in the order of their arrival in the IRB Office. The majority of submissions to the CHOP IRB including new protocols, amendments, continuing reviews and other reports are reviewed using expedited procedures. The categories of research eligible for expedited review are detailed on the webpage Expedited Review and are also listed in on OHRP's website Expedited Review Categories and on Expedited Review. Submissions that require full board review are scheduled for the next available IRB meeting. They must be received at least 8 - 10 days prior to the scheduled meeting. This allows time for a thorough pre-review by the IRB Analysts prior to placement on a meeting agenda. The meeting schedule for each of the IRBs is provided below. When the meeting agenda is full, additional submissions go to the next available convened meeting. The IRB Committees are constituted as general biomedical committees capable of reviewing any protocol. The Executive IRB meets weekly, in between Committee A meetings, and on an as needed basis to review urgent matters, possible non-compliance and unanticipated problems involving risks to subjects or others. What needs to be included in the submission? The IRB submission consists of the electronic application, a protocol, consent form(s), recruitment materials, and other relevant documents. The IRB makes determinations based on the information provided. If information is lacking, the IRB cannot grant approval. Required review and approval from ancillary committees (e.g. COI, Pharmacy, IBC, Contracting/Budgeting, etc.) will be sought concurrently. The table below outlines the materials that the IRB needs in order to review a study. The complete listing of the required materials for submission can be found in IRB SOP 301: IRB Submission Requirements and IRB SOP 402: Criteria for Approval. These guidelines below, apply to most research. However, each research study is unique and additional documents may be required in certain situations. The IRB reserves the right to request additional information if needed to conduct a complete review. The protocol is the most important component of an IRB submission. It describes the science behind the study, the detailed plan for executing the study and discusses the research ethics issues related to human subject participants. The IRB provides four protocol templates that can be adapted to meet the needs of virtually any study. The protocol templates should serve as a starting point; they are intended to be adapted to meet the requirements of the study design and not to be followed to the letter. Registry and Repository Protocol template: for studies whose sole objective is to store data and specimens for future research. Elements of this template should be combined with another template when setting up a Registry/Repository is only one of many objectives. The Investigators' Brochure is required for all investigational drugs and biologics. If the drug is marketed, the Package Insert may be substituted. Sponsor-supplied information sheets for investigational devices or the devices instructions (for approved devices) are required. Scientific review and approval performed by an approved Scientific Review Committee (SRC) is required for all prospective studies that have not been through an external review process (e.g., NIH, AHA, industry sponsor, etc.) prior to IRB submission. The SRC review form and the investigator's responses to any issues raised by the SRC, must be attached to the eIRB application. See Scientific Review for more detailed information. To satisfy CHOP Research Institute Policies, every member of the CHOP research team who is listed in eIRB must complete a study-specific financial disclosure statement via the eResearch eCOI portal. More information about Conflict of Interest Reporting is available on the CHOP website. The disclosure has a dual purpose; it allows the CHOP Conflict of Interest Committee to have a consistent means for assessing potential conflicts of interest and provides assurance that all members of the study team are aware of their involvement in the study. Recruitment materials (e.g. advertisements, flyers, letters) that are used to inform potential participants about a research study. See IRB SOP 703: Review of Recruitment Methods, Materials and Compensation. Questionnaires, surveys and other research study instruments. The IRB's webpage contains a listing of accepted Validated Instruments. Only study instruments not included on this list need to be attached to Section 12.02 of the eIRB application. Key References (OPTIONAL) A few (1 - 3) articles may be supplied for studies that are not accompanied by a grant or Investigators' Brochure to provide the IRB with additional background information related to the study. While incomplete submissions delay review of research, submissions that include extraneous materials also unnecessarily extend review time. In general, anything that is not a protocol, consent document, investigators' brochure or package insert, study instrument, or recruitment material does not need to be submitted. Case Report Form (CRF) pages. Note that while the IRB does not require (or necessarily want CRF pages), if the data that will be collected is not specified in the protocol, then the CRF pages may be submitted to supplement the protocol (eIRB Section 12.01 (1.0)). This is not ideal but is permitted. FDA Form 1572. The FDA, not the IRB, regulates this document. Department/Division Approval: All research studies require approval by the department or division chair (or other designated approver) before they can be processed by the IRB. The chair confirms that the investigator has the time and resources to conduct the study and is qualified to perform the study procedures. Letters of support: Research that involves subjects from outside the investigator's Department/Division require a letter of support from the Department/Division. 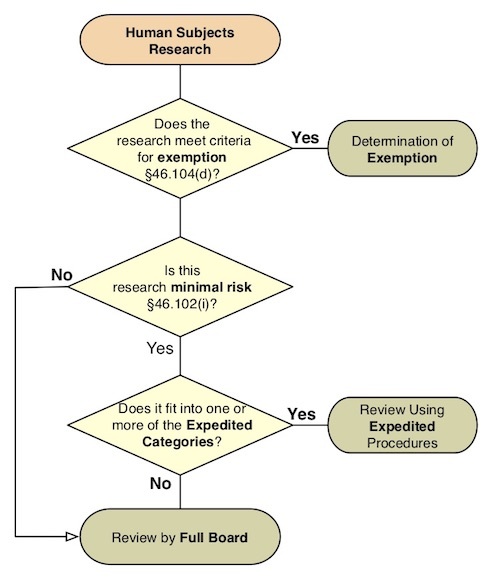 The regulations at 45 CFR 46.110 contain provisions that permit the use of expedited review procedures for human subjects research that is both minimal risk and where the research procedures are limited to one of the Expedited Review Categories published by OHRP in the Federal Register. Human subjects research that is not Exempt or eligible for Expedited Review must be reviewed at a convened meeting of the IRB. Full board review usually involves research that is greater than minimal risk but also includes minimal risk research that does not meet one or more of the Expedited Review Categories. Ancillary review assists the IRB with matters related to research feasibility, risk, regulatory requirements and research compliance. Not all studies require ancillary review. If ancillary review is required, documentation of IRB approval cannot be released until all ancillary reviews are completed. The eIRB system automatically routes submissions requiring an ancillary review to the appropriate departments or committees for approval. In a multicenter research study, the an individual or group of individuals charged with study oversight, coordination and overall conduct need to be identified. Those responsible could be simply the study Principal Investigator or there could be a more formal study Steering Committee or Data Coordinating Center (DCC). In addition, oversight may be the responsibility of a single entity or divided between multiple organizations. For industry sponsored studies the study sponsor or their designated CRO(s) (contract research organization) are required by the FDA to provide trial oversight.